Before the later part of the Georgian Period in England few buildings/structures specifically designed for trade and commerce existed. One need only to look at the timber wharfs of the Port of London to understand the haphazard way the people took up the need to greet the large number of ships arriving from around the world. Merchants often had their offices in the ground floors of their abodes. Shops were often no more than the front room of a house with a large window for display purposes. Warehouses were kept in cellars or outbuildings. Markets appeared on streets or upon a square, and businessmen had stalls or wagons or carts from which they conducted transactions. Only custom houses and exchanges were built specifically for business. According to John Summerson in Georgian London (Yale University Press, 1988), English imports and exports were valued as £13,000,000 in the early 1700s. By the end of Robert Walpole’s reign as Prime Minister in 1745, the value rose to £19,000,000. At the beginning of the Seven Years’ War in 1754, it achieved £20,000,000. The Seven Years’ War brought the commerce of India, Canada, and the West Indies to London’s ports. As the country turned toward the new century in the early 1790s, the value rose again to £34,000,000. By 1800, the value rose again to nearly £61,000,000. Only one port authority controlled the Thames coming to London’s doors. “The Legal Quays of England were created by the Act of Frauds (1 Elizabeth I, c. 11), an Act of Parliament enacted in 1559 during the reign of Elizabeth I of England. It established new rules for customs in England in order to boost the Crown’s finances. One of its most important provisions was the establishment of a rule that it was illegal to land or load goods anywhere other than authorised Legal Quays in London and other ports, under the supervision of customs officers. “After the outbreak of the French Revolution in 1789, Britain remained neutral, watching from the side-lines, but in 1793, when French troops occupied Belgian lands, threatening the Dutch as well as British overland trade via the River Scheldt, war was instigated. British troops were sent onto continental Europe, but were defeated at the battle of Hondschoote in the September of 1793.” (Historia Nerdicus) This introduction into a war with France brought to the forefront the need to correct the system of legal quays. The City of London in cooperation with a stock company earned the right to build a dock and a canal on the Isle of Dogs in July 1799 by Royal Assent. The West India Dock, in the Isle of Dogs, began in 1800. These were cargo-handling docks. 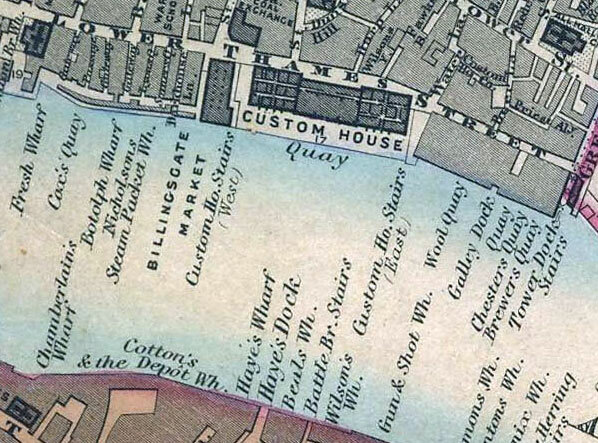 The West India Dock was followed by the London Dock at Wapping (1802), the Surrey (Greenland Docks)in 1804, the East India Dock at Blackwall (1805), and finally, the St. Katherine’s Dock (1825). All these structures were controlled by private companies. This entry was posted in British history, Great Britain, Living in the Regency, real life tales, Regency era and tagged commerce, docks, Georgian Era, Georgian London, Thames, trade. Bookmark the permalink. I was researching my Regency romance novella – my first attempt in the genre – and my Google search led me to your blog. It is fascinating. There is so much about the era I don’t know that it’s almost disheartening. Last year, you had a couple interesting entries about death and mourning, but nothing that would answer my particular questions. If a man is executed as a traitor, would the mourning rules apply to his family? Do they have to mourn him with all the trappings? Should they? I know it is very specific, but maybe you do know the answer? If not, perhaps you know where I should look. I would assume so, but I am not an expert in that part of the Regency era. You may want to check with Nancy Mayer, Regency Researcher. http://www.susannaives.com/nancyregencyresearcher/ She has an “Ask Nancy” tab on the site. If you are a member of the Beau Monde (the Regency chapter of the Romance Writers of America) you could place your specific question on the chapter’s email loop and MANY will respond with appropriate information. Candice Hern’s site http://candicehern.com (Try her Regency World RSS feed or her FAQs) is also an excellent source of Regency information as is the one run by Cheryl Bolen. http://www.cherylbolen.com/writings.htm If you find nothing among these resources, contact me again, and I will attempt to assist you further. Good luck with your writing. I appreciate your sharing this elsewhere. FANtastic historical information about the London Docks! I’ll share Part II tomorrow. Thanks bunches, Author Regina Jeffers!